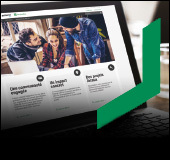 You are here: Home> Personal > Caisse populaire Desjardins de Charlesbourg > Events, news and publications > Always in a hurry? Go to toutletempsaccessible.com (site in French only) - External link. This link will open in a new window. to learn all the ways your caisse makes it easier for you to do your banking. With multiple service centres open Saturdays throughout the Greater Quebec City area, your caisse is here to make your banking easier for you!